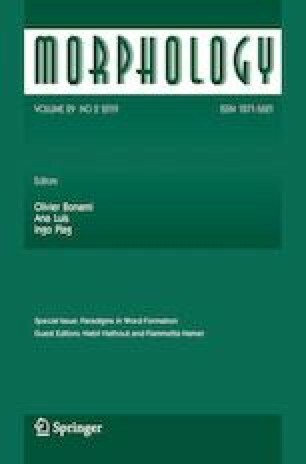 This contribution aims at showing how paradigms and associative relations can be integrated into word-formation, with special attention paid to compounding. In this regard, we will take into account a phenomenon at the border between derivation and compounding, namely formations like süßherzig ‘sweet-hearted’, in which -ig is an adjective-forming suffix and AN a possible compound. To do so, we will explore data available from a large web corpus, on whose basis we will show how syntagmatic and paradigmatic relations developed in syntax find their way into word formation. We will show that the most productive compounding schemas as they are currently assumed in Construction Morphology give rise to processes of semi-affixation which are a first step toward derivation proper. Parts of this paper were presented at the workshop on “Paradigms in Word Formation” held during the 49th International Annual Meeting of the Societas Linguistica Europaea at the University of Naples “Federico II” (31.8.–3.9.2016), as well as in a lecture given at the University of Erlangen (16.1.2018). We thank all people attending the workshop, and especially Fiammetta Namer and Nabil Hathout, as well as two anonymous reviewers for helpful comments and remarks. Needless to say, all remaining mistakes are ours.